A recent introduction from Holland that is becoming rather popular. 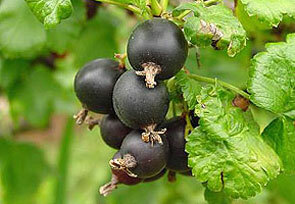 The jostaberry is a blackcurrant x gooseberry hybrid, with fruits that resemble a large blackcurrant. Pleasant flavour and quite heavy cropping. Very good resistance to Mildew. The growth is like a strong growing blackcurrant with similar leaves and stems. Plant 6' apart, if you have difficulty growing blackcurrants then this variety is a must for its Mildew resistance.